Silent Installations are now available for all IDAutomation Software. Beginning in 2014, silent installations are available for all IDAutomation Software with the purchase of any Site License or Developer License. The silent installations are added to each software package as they receive updates. If the package ordered does not currently contain a silent install file, it may be provided by request within 1-2 business days in most cases. The silent installation provided includes a source script that may be customized and easily recompiled to meet the needs of your organization. A download link for the compiler will be provided within the silent install package. In this example, the silent install for the Code 128 Font Package is used. 1. Right-click the IDAutomation_C128Font_SilentInstall.zip folder and select Extract All. 2. Double-click the IDAutomation_C128Font_SilentInstall folder. 3. Note the locate/path of the EXE. For information of the silent install options, open the Silent Install Readme.html file. 4. 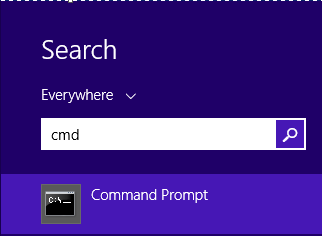 Use Windows to open the Command Prompt. 5. 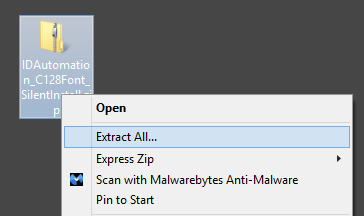 Change the directory to the location of the silent install exe file. /VERYSILENT - Very silent mode. No windows are displayed. /NOICONS - No shortcuts are created.